Finding My Stitch: Happy Halloween! Hope everyone had a great Halloween weekend! I know I did. Unfortunately, though, I haven't gotten much crafting done since I spent the whole weekend visiting my boyfriend. It was fun, we went to two different parties and had to throw together some last-minute costumes. Friday night we went as Doug Funnie (as Quailman) and Patty Mayonnaise from the awesome cartoon Doug. Is anyone else as nostalgic about these 90s cartoons as I am? I want to be a kid again! I actually don't have any pictures of us wearing these costumes. Shawn's looked great, but my Patty Mayonnaise needed a little work...especially the wig! But oh well, maybe I can revamp it and we can wear them again sometime. Saturday night, we decided to go as something different...Shawn ended up finding clothes he already had to go as Andy Kaufman. It looked awesome! 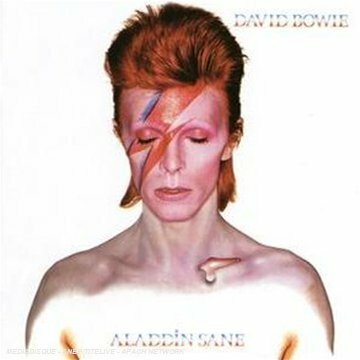 I didn't have much so I painted the lightning bolt design from David Bowie's Aladdin Sane album on my face. I just wore black leggings and a blue shirt since the album cover is only his face. Not really a costume so much as makeup, but it was still fun to try. Now I really want to watch Man on the Moon! It's not much yet, but it eventually will be a ribbed knit scarf. I plan to make it blue and white stripes, I'm just not sure yet how wide I'll make the stripes. I also plan to try out this hat pattern soon. It's so cute, and looks pretty easy. Should be fun! Did Shawn wear underwear on the outside like Quailman? That's a great spoof on Superman's awkward-looking outfit.